Book on Online sites: The African American Researcher’s Guide to Online Genealogical Sources by Fallon N. Green: From the personal notebook of Genealogist Fallon N. Green, Author House, 2012. 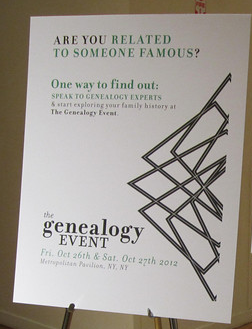 I’m real psyched to be attending and presenting at the first every “The Genealogy Event” in New York City! It will be held on Friday October 26 and Saturday October 27th at the Metropolitan Pavillion in New York City. I will be presenting “Introduction to African-American Genealogy Research” at 1:15, and “Online Sites for African-American Genealogy Research” at 4:15. There will be a number of vendors there, including Ancestry.Com and Family Tree Magazines, both sponsors. At $15 a day, this is the best deal going! For more details, go to www.thegenealogyevent.com.